I need help with graphics. Read more here. Download the zolu.zip, unpack it into any directory and start the ZoluClient.bat. Please choose a login and make sure the password is the same as your login. This site is meant to keep you updated on the (slow) progress of my Othello Game Server Project. The server is not running around the clock but if you feel like testing, and you reach me online, i can turn it on. The current Version is not stable enough and has not enough features to consider running it 24/7. The German Othello community is going to use it for the weekly Othello class in which Sebastian Schmidt teaches a bunch of new players for about an hour. For the following features this Version is already good enough to replace other Servers for teaching purposes. Those features are mostly only available in training mode so when i write "trainer" it means the table host during a game in training mode. The trainer may play at his turn and his opponent's turn while his opponent can only play his own turn. (*): the board setup function is still somewhat buggy. It usually works if it's black's turn when using it, but if it's white's turn it may crash all clients connected to the game room due to a bug with the history panel that I didn't get time to take care of yet. 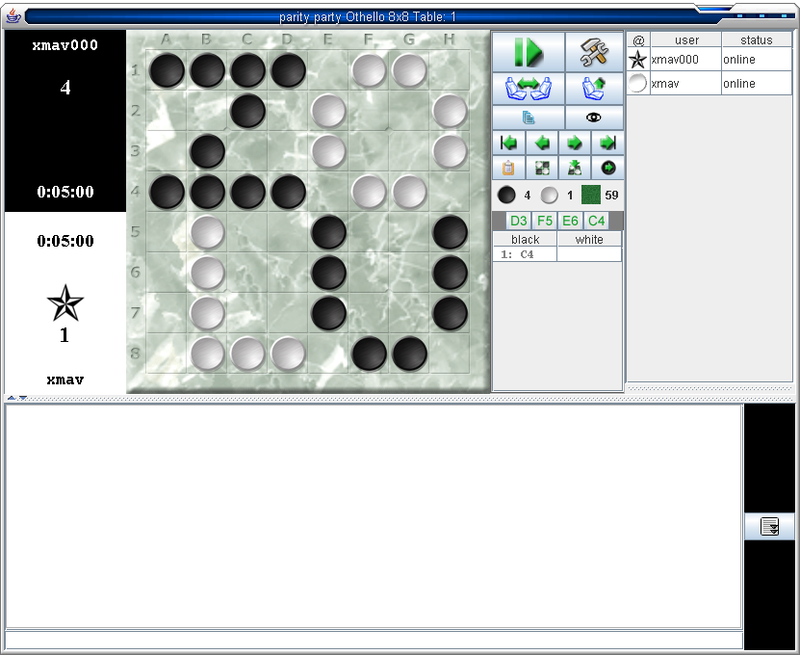 Some screenshots taken mid of april 2007 you can see below (2 of them during the Othello class). 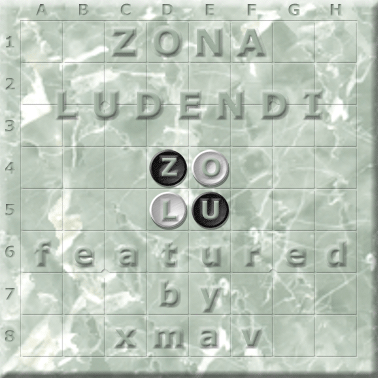 I have been thinking of making a new Othello gaming site since arround 2002. I also have been starting small projects in this area for my university studies. I first started with a TCL/TK Client and Service for GGS. That was started with four persons with the main goal to have a project for the class "Concepts of programming". In that time i worked out a lot of ideas that i would like to see in a game site. Ben also wrote down a long list of what he thinks would make a perfect game site. I talked a lot with Michael and Igor on GGS and learned a lot of concepts of GGS and game sites in general. The resulting TCL client was fair enough for a programming project for a 3rd semester student but it wasn't anything worth to keep working on. In that semester i learnt a real lot of TCL programming and that's something i still enjoy. A year later i started a new project for the class "Middleware and component programming". I somehow found 3 guys to make a team and i said i want this project, don't care which programming language. So their choice was Java and CORBA. One team member dropped out early (just didn't come to university for some weeks anymore), the other two were not reliable either. They somehow managed to just take the database part and left the game engine, client, server for me. Anyway that was some real sad story and the result was that i took off one of my two vacation weeks (for bachelor project) and got two of my good friends to work out something that i can present at the deadline. The server was just able to let two players play. They couldn't choose who they want to play, they just get the next entering player as opponent. Besides not being capable a lot, the server also was very buggy, so not very usefull. I have been working on this site mainly in February and March 2005 and January - March 2006. 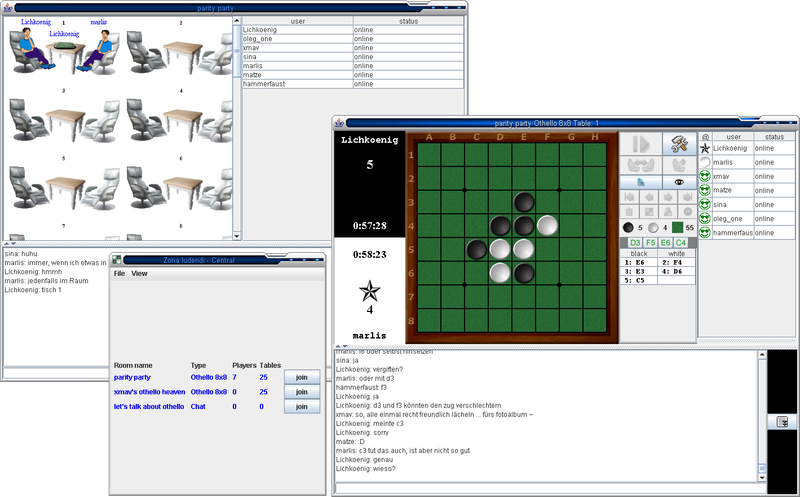 In February 2005 i used the game engine and some of the client code and most of the graphics to create an othello program. that didn't get very far and when i noticed i had so much fun making new graphics and it would be cool to have those for a game site i just started the Zolu Game Project (again?!?) and used most of the code written in February for it. Begin of april 2005 i had to stop working on it because my university studies kept me busy. At that time the basic structure of client, server, roomserver existed and clients were able to log on the central server, ask for the IPs of the room servers and then ask the room servers for room lists. I was just about to be able to actually join a room when i had to stop. In January 2006 i started working on it again. Reached a version on which we actually played a few games with some players online. April 2006 the new semester started and so i had to put the project on ice again. 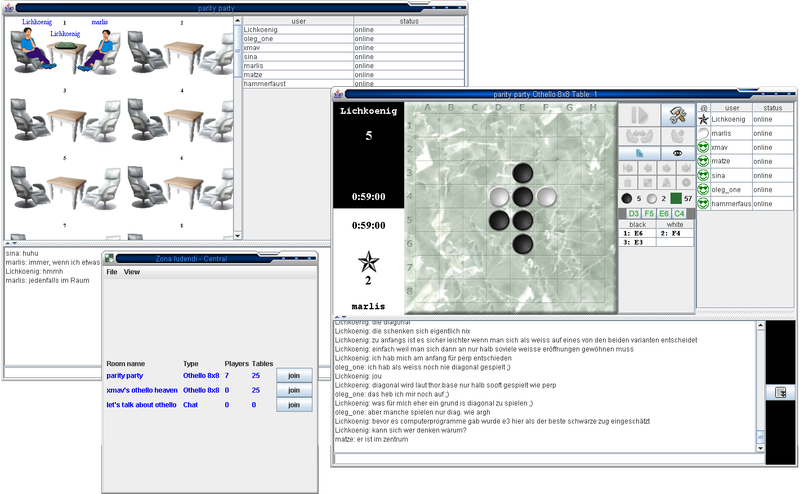 During winter semester 2006/07 I used some of its code to make a game browser applet. In winter semester break 2007 i updated the design of the server and put in serval new features in order to make it usefull for teaching purposes. In April the semester started and the project has been put on ice again. But as written above it reached a state where it's usefull for Othello classes and we will hopefully use it for that during the next months.